Bruges is one of Belgium’s best-preserved medieval cities. Game of Thrones fans will appreciate the picturesque canals, turreted manor houses and gilded spires that help attract millions of tourists every year. 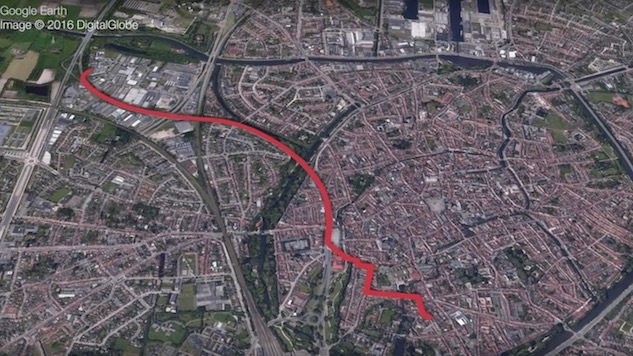 But hidden beneath the city’s historic cobblestone streets lies something even more remarkable: a two-mile long pipeline made exclusively for beer. YouTuber Tom Scott recently visited Bruges to give viewers a closer look at just how this innovative beer transportation system works. The booze tube, which has been operating since September last year, carries over 1,300 gallons of beer every hour from the city’s oldest working brewery near the center of Bruges to a bottling plant on its outskirts. Think of the original brewery as a kind of heart, pumping Belgian lifeblood through polyethylene “veins” to keep one of the country’s oldest traditions alive. The subterranean booze pipe also helps to rid the city center of beer-laden tankers that can be tricky to steer through the narrow lanes originally built for horses and carts. The Halve Maan (Half Moon) Brewery pumps out around five millions litres of beer every year (cough), and that means a lot of transport trucks weaving their way through the tourist-heavy city. According to the brewery’s director, Xavier Vanneste, the new pipeline will result in a reduction of 250-300 tanker trucks in Bruges every year. Vanneste’s ancestors took over the brewery in 1856, and while many other beermakers succumbed to trying times, the Halve Maan persevered and has grown significantly over the last century and a half. Today, as global interest in Belgian beer surges alongside the thriving craft beer industry, the Halve Maan is enjoying a massive increase in sales and currently exports their products to 30 countries. Their growth called for bigger premises, but Vanneste wasn’t about to give up on tradition in favor of commerical interests. He needed a large bottling plant, but didn’t want to leave the historic home of the brewery. Hence, the pipeline was born. The unique project cost a cool $4.5 million to install and required four years of planning, five months of construction and countless hours spent convincing city officials that a giant beer hose was a good enough reason to dig holes in the ancient city streets. People have been hanging out in Bruges since the Bronze Age and much of the architecture dates back to the 13th and 14th centuries. In 2000, the entire city centre was declared a UNESCO World Heritage Site, making it difficult for private companies to secure construction permits. Fortunately for Vanneste, the pipeline made the cut, but burrowing beneath all that history required some careful planning. Extensive research had to be carried out to determine exactly what lay beneath the cobblestone before tunnelling experts were recruited from the oil and gas industry to do the drilling. Construction was limited to public streets and heaps of engineering brain-power was applied to ensure that impact on the historic buildings and roads was kept to a minimum. A computer-guided drill carefully crafted a 1.3-foot wide hole for the pipeline, diving deeper when necessary to avoid destroying the ancient architecture. It’s all very impressive, but is it practical? The easy solution would have been to simply move the brewing equipment to the larger bottling plant where everything could be done under one roof, but for Vanneste, the problem was not purely a logistical one. Visitors to Bruges can catch a glimpse of the engineering marvel via a transparent manhole cover carved into the cobblestone near the brewery. And while you’re in the area, pop in at the Halve Maan for a brewery tour. Part of the brewery-turned-museum was recently revamped to include a sneak peek at an authentic kiln. Be sure to top the tour off with a pint of Belgian history, while beneath your feet the next tasty batch flows steadily to the bottling plant in a marvelous fusion of modern engineering and age-old tradition.